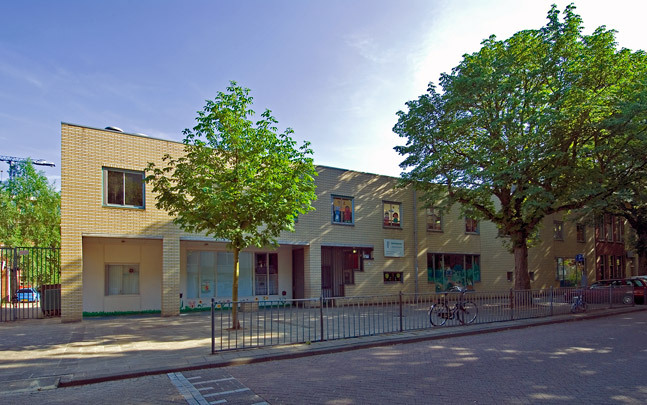 The eight classrooms of this primary school are arranged stepwise in two storeys and orientated to the south. Both floors add a number of work spaces and a room for extra-educational activities. Hall and corridor space in front of classrooms can be used for play or study. There is a roof light above the stairwell and room entrances. The open character of the facade to the playground contrasts with the introverted, formal street elevation. Glass and panels in a wooden framework reveal the building's function and structure.